We celebrated Carter's birthday on Sunday with our family and closest friends. I was so happy that he absolutely loved everything and had such a great time. He talked about his "Mickey Party" for weeks and has been watching birthday episodes of Mickey and Daniel Tiger on repeat, so he knew what to expect and he didn't even cry when everyone sang to him! He didn't cry at all and with 20 people in our house that's pretty good! Last year I made all the decorations, but this year I just don't have the time so I ordered a few on ETSY, made the hanging Mickey banners above the dessert table and bought the pre-made party set at Walmart. one of our games (from Party City) I also made a bean bag toss and we limbo-ed! Since the party was at 3:00 we just had snacks- soft pretzel bites and dips, fruit, veggies & dip, goldfish, and cake and cupcakes! We had lemonade (add your own vodka), beer, and water bottles. all the kids minus Ian- he cried and didn't want to be in the picture, surprisingly that wasn't my kid this time! Carter had such a blast and we couldn't have been happier! 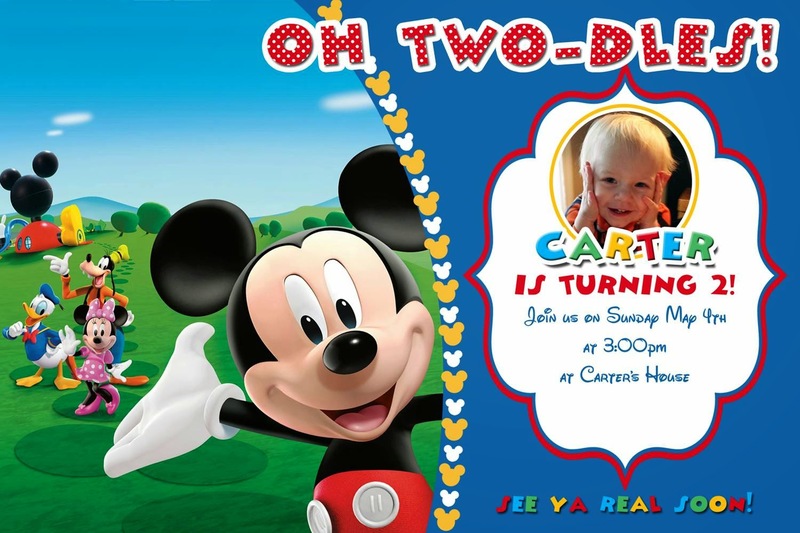 Click here and here for Carter's first birthday party! Cupcake toppers and food tent cards: JK Designs.